The Ridgway Visitor Center is the main entrance to the Missouri Botanical Garden, located at 4344 Shaw Blvd. in St. Louis. 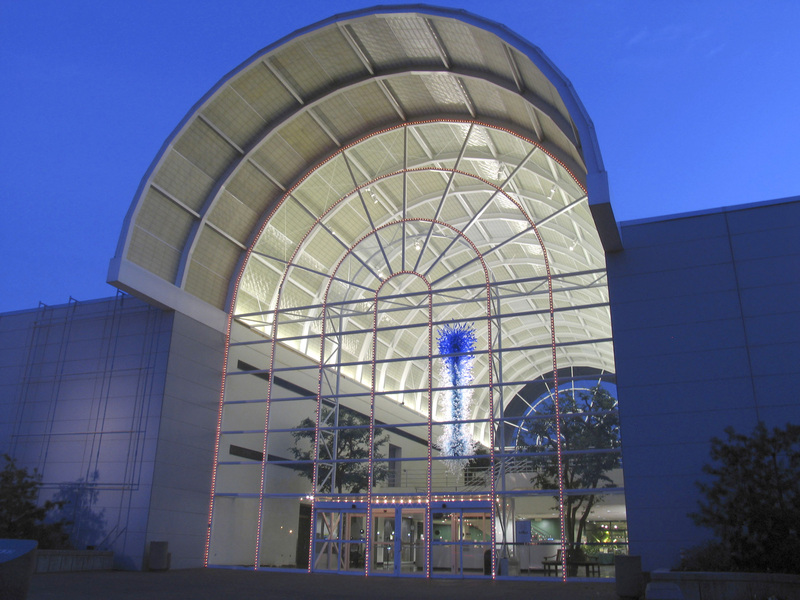 The building was designed by St. Louis-based Hellmuth, Obata, and Kassabaum and opened in 1982. It replaced the Flora Gate (now Spink Pavilion), located at 2101 Tower Grove, as the main entrance into the Garden. The Ridgway Visitor Center is recognizable by its large, barrel-vaulted ceiling, inspired by the Crystal Palace of the 1851 Great Exhibition in London, which Garden founder Henry Shaw visited. Missouri Botanical Garden Blue Chandelier, 2006, by renowned glass artist Dale Chihuly, hangs from the atrium, visible through the front window. The sculpture was assembled on site in mid-air in January 2006 as a preview to the “Glass in the Garden: Chihuly at the Missouri Botanical Garden” exhibition. The sculpture was purchased for the Garden with funds donated by Emerson and from the estate of Dr. Richard I.C. and Barbara Hagnauer Muckerman, in honor of Hilbert W. and Amy J. Hagnauer. The installation weighs 2,300 pounds and measures six feet across by over 20 feet long. It consists of 928 individual blue and clear glass spirals and gooseneck shapes. A free parking lot with over 475 spaces is adjacent to the Ridgway Visitor Center. From 2010 to 2012, the Garden renovated the parking lots featuring areas of porous asphalt, concrete and brick paving along with bioswales for parking lot rain water. Visitors purchase admission to the Garden at ticket windows and enter the center on the lower level. Stairs or an elevator takes guests to the upper level to access the Garden grounds. Visitors can inquire about becoming Garden members at the Membership Services Desk, or check with the officer stationed at the Security Desk for lost and found items. An ATM and a beverage vending machine are also located on the lower level. Restrooms and drinking fountains are on both levels of the visitor center. The lower level includes the 380-seat Shoenberg Theater, which hosts events, lectures and concerts throughout the year. The Garden Gate Shop stocks a variety of fine gifts, plants, books, jewelry and garden accessories. Shop trunk shows can be found in Grigg Lobby. The Orthwein Floral Display Hall is the site of the annual Orchid Show and the Gardenland Express holiday flower and train show, in addition to plant society shows, sales and other events throughout the year. The Jordan Education Wing includes the Beaumont, Missouri, Botanical and Garden rooms for classes and meetings. An orchid display blooms in the Beaumont Room all year. The upper level includes the 3,600-square-foot Monsanto Hall, a premiere location for private parties and corporate events. Rotating art and photography exhibits often grace the walls, including a popular holiday wreath display. An old-fashioned cart features Plants in Bloom, a sampling of fresh blossoms cut from plants throughout the Garden. Each is mapped and labeled to give visitors a preview of what they’ll see before they step outside. Sassafras, the Garden’s café, offers a variety of soups, salads and sandwiches for lunchtime dining from 11 a.m. to 3 p.m. Light refreshments are available throughout the day. The inside dining facility was renovated in 2005 incorporating a variety of environmentally-friendly materials to promote the Garden’s message of sustainability. The café features warm, earth-toned décor and comfortable upholstered banquettes. 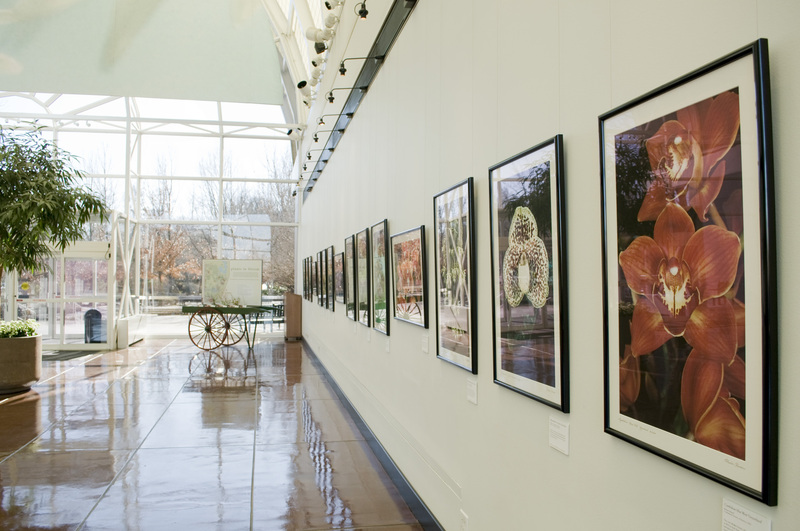 Framed botanical artwork from the Garden’s rare book collection is displayed on the walls. Seating is available first-come, first-served both inside and seasonally outside on the veranda. Stroller parking is available just outside the Sassafras entrance in Monsanto Hall. Also on the upper level, the Spink Gallery features an impressive array of porcelain sculptures created by the late artist Edward Marshall Boehm and donated by Mrs. Edith Spink and her husband, Mr. C.C. Johnson Spink. Edward Marshall Boehm, a naturalist farmer, began designing porcelain sculpture in 1944. He began his career by sculpting animals, and introduced his first series of birds in 1951. With an ornithologist’s perspective, Boehm sculpted each bird in its natural habitat, carefully recreating its seasonal coloration and capturing its unique behavioral characteristics. Of special interest are the Mute Swans (“Birds of Peace”), the original of which was presented by President Nixon to Chairman Mao and the Chinese people as a peace offering in 1972. Another magnificent piece is the "Eagle of Freedom," the original of which was presented to John F. Kennedy by The Democratic Party of New Jersey in 1961.